Explore one of Chicagoloand's most haunted places this Saturday, Oct. 28, during a night-time hike. OAK FOREST, IL -- One of Chicagoland’s most haunted spots (allegedly) is offering a night-time hike sponsored by the Forest Preserves of Cook County. Hikers will have the opportunity to hike to the historic Bachelor’s Grove cemetery, where more than 100 hauntings are said to have been documented. The hike is free, but people have to be in line by 5 p.m. Oct. 28 at Camp Sullivan, located at 14630 Oak Park Ave in Oak Forest (near 147th Street and Oak Park Avenue). ADDED: Multiple hikes will take place from 5 to 7 p.m. Oct. 28, so people can show up anytime between then. Those who want to participate should drive and park at Rubio Woods parking lot and will be able to cross Midlothian Turnpike and walk down to the cemetery. The hike/tour will be led by Forest Preserve of Cook County staff and an individual from Chicago-based Midnight Paranormal Society. Camp Sullivan, 14630 Oak Park Ave, Oak Forest, is hosting a woodsy evening of ghost stories, face painting ghost stories for families from 5 to 9 p.m. this Saturday. The evening also features live music with the Hoyle Brothers and there will be a food truck. The settlement began in the late 1820s, according to the Bachelor’s Grove Settlement and Research Center. The original settlers were said to be American “Yankees” of English, Irish and Scottish descent who came from New York, Vermont and Connecticut. Along around the 1830s and 1840s, a second wave of settlers came to the grove from Europe, primarily of German origin. In the late 1840s, German immigrants became the predominant nationality of area settlers for the next half-century. An early settler by the name of Stephen H. Rexford, who settled in “The Grove” in 1833 or 1844, claimed the settlement was named for four single men, himself included. More likely the settlement took on the name of an extended family of German immigrants whose last name was “Batchelor.” The trail leading into the settlement is marked by a ramshackle cemetery of mostly 19th century gravesights, although the last official burials in the cemetery took place in 1965. The cemetery is also said to have been a favorite dumping ground for Chicago gangsters. The white lady (or "white madonna"), who supposedly walks around the cemetery carrying an infant during full moons. A shimmering phantom farmhouse that shrinks and disappears when you get close to it, most commonly reported during the 1950s. A farmer and his plow horse killed in a farming accident that were said to be dragged to a nearby slough. A two headed ghost near the same slough. Religious monks in robes that witnesses claimed to see roaming the woods near the cemetery in 1984. A black dog at the cemetery’s entrance, reported in the 1990s, that vanished as visitors approached it. A woman sitting on a grave, documented in a Sun-Times photograph; all of the apparition could not be seen in the actual picture. Phantom cars on a nearby road. Paranormal investigators have also recorded electronic voice phenomena in the area. Hikers are more likely to encounter looky-loo ghost hunters this Saturday, as opposed to actual ghost sightings. Bring a coat and dress warm. You might also want to wear shoes you don't mind getting muddy from recent rains. 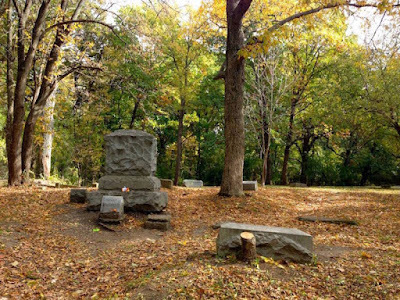 The hike will be attended by members of the Bachelors Grove Cemetery and Settlement Research Center.